← Can Historic Preservation Handle the “Buffalove”? Among the collections of the Preservation Research Office is a stock of amateur photographs showing changed in the St. Louis built environment at the last century’s middle point. Our collection draws from many anonymous urban gazers who took to the streets with cameras between 1935 and 1980. 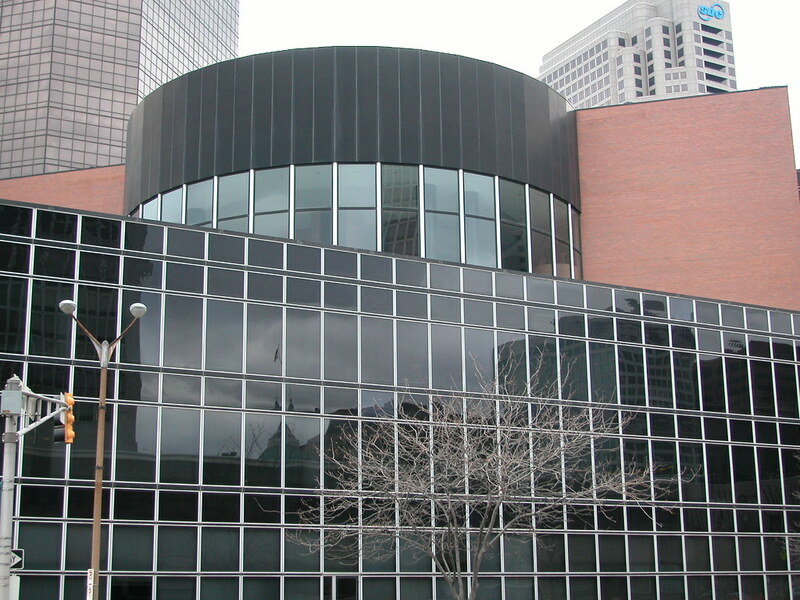 Toward the end of the chronology come the photographs of big late modernist buildings like the Bel Air East (1964; Hausner & Macsai), the Laclede Gas Building (1969; Emery Roth & Sons), Council Plaza (1965-1969; Schwarz & Van Hoefen), Pet Plaza (1969; A.L. Aydelott) and the General American Life Insurance Company Building (1977; Johnson/Burgee). 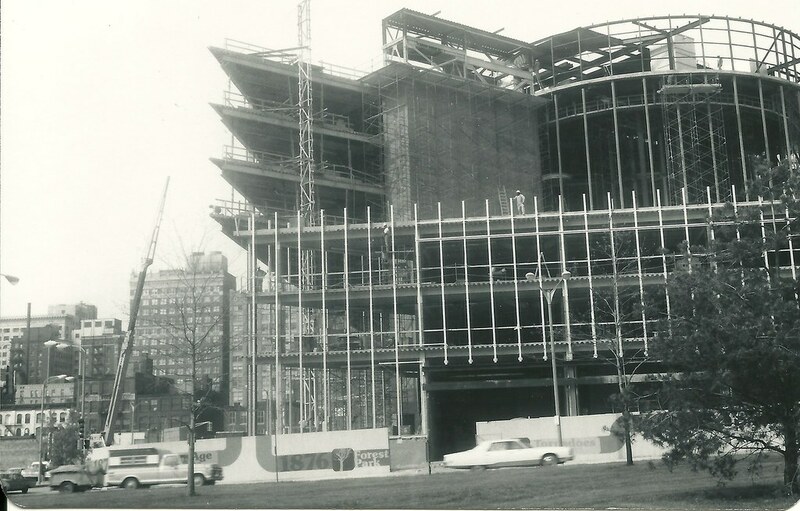 The General American building rises in the late 1970s. Undated photograph. Source: Preservation Research Office Collection. As the transfer of Laclede Gas from one downtown building to another sparks debate about the use of tax incentives to shuffle the downtown deck, we offer some views at the origin of the General American building. At the time of the building’s completion in 1977, the General American Life Insurance Building was a symbol of downtown corporate pride — the sort of pride that would have been wounded knowing that the building would require massive subsidy to be reused only 36 years later. Old downtown meets new downtown, 1977 style. Source: Preservation Research Office Collection. 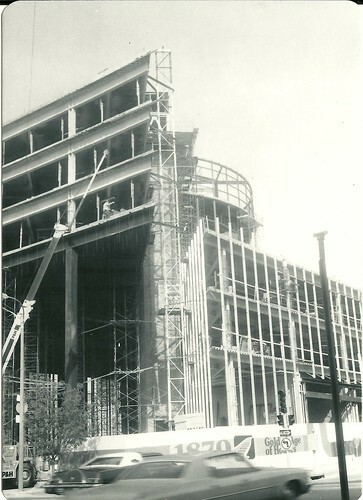 The General American building followed the heels of the city’s wishfully-triumphant attempts at creating a monumental corporate landscape around the Gateway Mall. City leaders yearned to make the Gateway Arch the focal point of a green swath framed by high-style office buildings that enshrined both the virtue of companies keeping their headquarters downtown and the ambitions of the city to build great buildings once more. General American’s headquarters fulfilled both, as did subsequent buildings along the mall path in their own more subtle ways. The mall itself proved to be the most challenging ingredient in the landscape. Planes converging at Eighth and Walnut Streets during construction. Source: Preservation Research Office Collection. 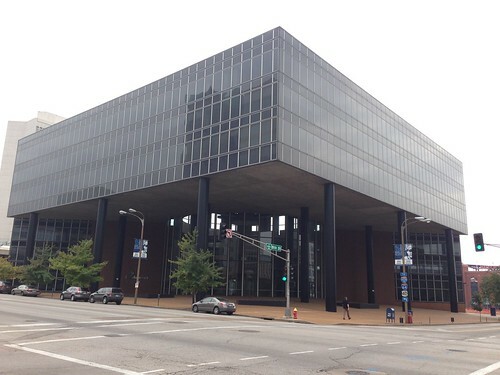 In 1964 (the city’s proud bicentennial year), the city designed 42 blocks of downtown St. Louis as the “Civic Center Redevelopment Project” to be a new face of the city’s civic self. 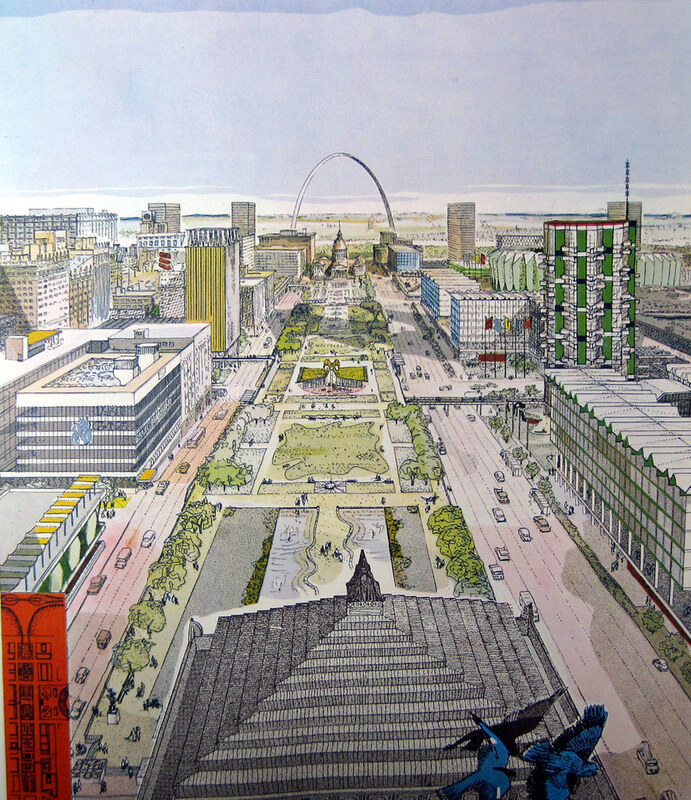 The project was created to realize the recommendations of the 1960 document A Plan for Downtown St. Louis, which outlines an intensive reconstruction of downtown’s eastern and southern ends. The Jefferson National Expansion Memorial landscape, where the Arch was nearing completion, was the primary impetus. The envisioned east-west park ribbon between Market and Chestnut streets was the second. 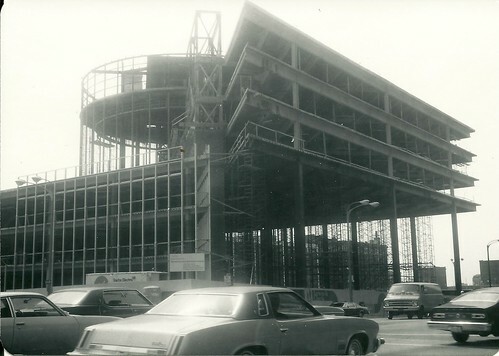 By 1975, over $300 million in tax-abated development projects were complete in the area. Public subsidy’s roots in downtown development now extend to the origin of buildings potentially being subsidized in our era. Bluebirds of happiness fly over a new park mall surrounded by corporate office buildings in this 1960 rendering from _A Plan for Downtown St. Louis_. Kurt Perlsee drew this perspective based on the plan’s recommendations. Johnson/Burgee’s building would by far be the most impressive built in downtown for years to come; perhaps it has yet to be surpassed. The pair’s switch-cut of essentially a three story building into two cylinder-joined triangles killed the glass box. As CORTEX continues to produce ground-hugging, boxy buildings seemingly afraid of offending anyone’s taste, we should be examining the way in which the General American building transformed what could have been a dull low-rise office building into a sculptural work every bit suited for an important downtown site. 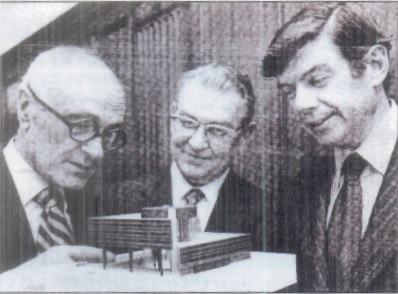 Philip Johnson and John Burgee flank General American President Armand C. Stalnaker as they examine a model of the new headquarters building in 1977. “a series of clear architectural pieces in locked combat with each other.” Johnson/Burge essentially twisted the Miesian glass box, defying an architectural era divided between reverent homages (Yamasaki’s World Trade Center, SOM’s Sears Tower) and heavy geometric abstraction (Roche & Dinkeloo’s Ford Foundation Building, Aydelott’s Pet Plaza in St. Louis). 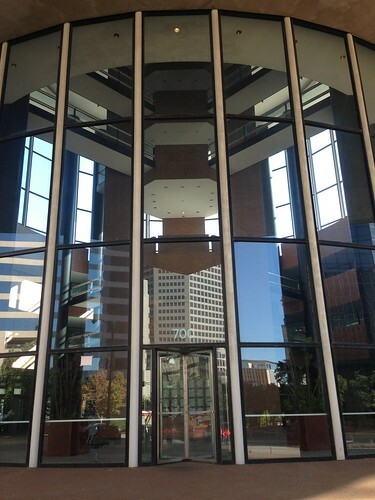 One year before the St. Louis building opened, Johnson/Burgee saw their ceremonial decapitation of the glass box, Pennzoil Place, completed in Houston. 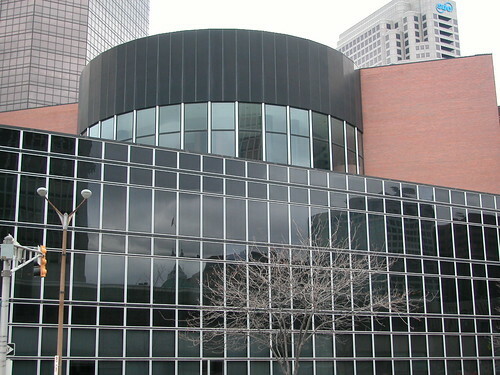 Johnson would won the 1979 AIA Gold Medal for his work at Pennzoil place. Geometry — and material, with the red brick element — in conflict? The General American building was a smaller break from modernist stricture, but not an insignificant one. General American’s completion in 1977 garnered critical acclaim from St. Louis Post-Dispatch critic Robert W. Duffy, who wrote that the “one of the most spectacular buildings to be built in St. Louis in years, and what is regarded as one of the most spectacular buildings to be opened in the United States in 1977.” In subsequent years, however, historians have not given the General American building a high rank in the Johnson/Burgee canon. Looking at the building from inside of Citygarden at Eighth and Market streets. When Melinda Winchester presented the National Register of Historic Places nomination for the building at the Missouri Advisory Council on Historic Places in 2007, the nomination caused a stir. Council members faced with a rather young building debated whether St. Louis possesses a fine example of the combined geniuses of Philip Johnson and John Burgee, or whether this was one of their minor works unworthy of the national designation before its fiftieth birthday. Ultimately, the building entered the National Register in 2008 (with an exceptional significance consideration), when it was 31 years old. The entrance, looking into the soaring cylindrical atrium. 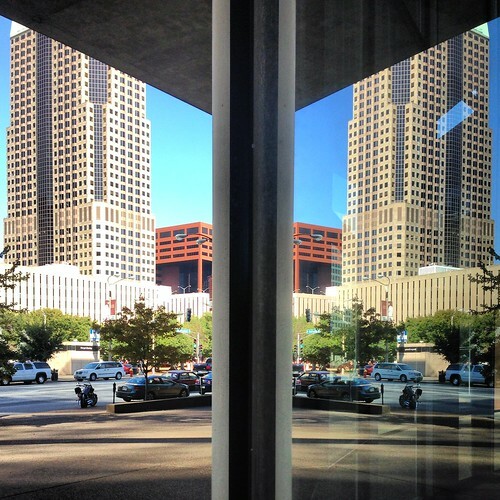 Postmodern is doubled in the reflections of the Metropolitan Square (1989; HOK) and St. Louis Place (1983) buildings on the glass lobby wall at the General American Life Insurance Company Building. Today, the General American Life Insurance Company Building stands as testament to earlier civic optimism and corporate conviction in downtown’s future. The building preceded a small boom in construction that partially fulfilled earlier hopes for the Gateway Mall. Edward Larrabee Barnes’ 1010 Market Street (1981) and HOK’s One Bell Center (1987) maintain the trajectory set by Johnson/Burgee, while the Robert L. Boland’s Gateway One on the Mall (1985) is a glaring mediocrity. The architectural tenor of the Gateway Mall was improved tremendously a few years ago when Citygarden opened diagonally from the General American Building. Whatever happens to the tax increment financing proposed for the General American building, it remains one of downtown’s most inimitable recent landmarks. We offer grateful thanks to our former intern Christina Carlson for scanning the General American construction photographs. This entry was posted in Downtown, Mid-Century Modern, PRO Collection. Bookmark the permalink. What a succinct and insightful critique! Only a preservationist could still ‘see’ the city patrons vision of a mall ‘wishfully-triumphant attempts at creating a monumental corporate landscape around the Gateway Mall. ‘ Wistfully Triumphant! That must have been the fight song for the last ten generations of (failed) Civic Progress leaders! It’s worth noting that the brilliant, rebellious landscape design of City Garden, defined a civic pride of place for for the mall–and for downtown. Not (phallic) architecture. It’s also worth noting that Saint Louis has an aversion to tall, dense urbanity. As soon as an area gets too many towers, they are either torn down within a few decades or abandoned by pedestrians (downtown/Clayton). I attribute that to our start as a rancorous French outpost in the heart of hostile territory. Saint Louis is still incorrigible and defiant. Most of the region’s residents prefer a lower, ‘four-corner’ urbanity. Civic Progress types might find more success in a subtle, European ‘corporate landscape’. I used to work here immediately following my high school graduation in 1981. I was 17, and to say I was highly impressed to be working in this building is an understatement. I have fond memories of riding those glass elevators each day and taking long walks around Busch Stadium directly behind it! Edwin Trusheim was the President of General American at the time, and there was a second location in South County. Great memories! I worked in the county GA offices and occasionally visited downtown. I must say, the practical side of me wondered why they would take a three story building, cut it like a sandwich, hollow out the middle, hike up one half and have about 1 1/2 floors of actual usable office space in a prime downtown location. Just seemed like a waste. Sharing this link with with the GA alums. Thank you. For about 20 years I worked on the top floor of the GA building at 7th and Market, after moving from the company’s farther-west original building. Walking into that enormous lobby and traveling across the walkway from the central elevators to my office brought an uplift to the entire day. Criticizing the “wasted space” in the middle is like saying your back yard is wasted space. The building was a jewel and I’m confident it will remain one.